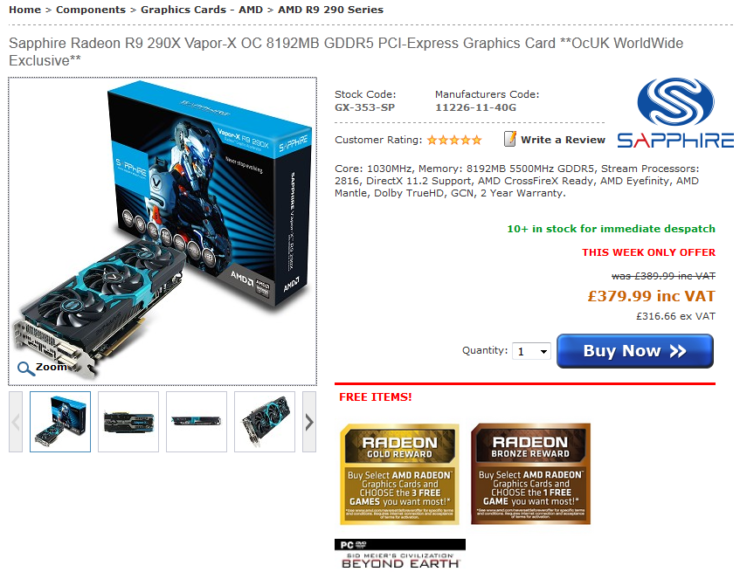 We’ve only just covered the prospective launch of 8GB R9 290X cards last week. And we’re already starting to see those cards pop-up in E-Tail. 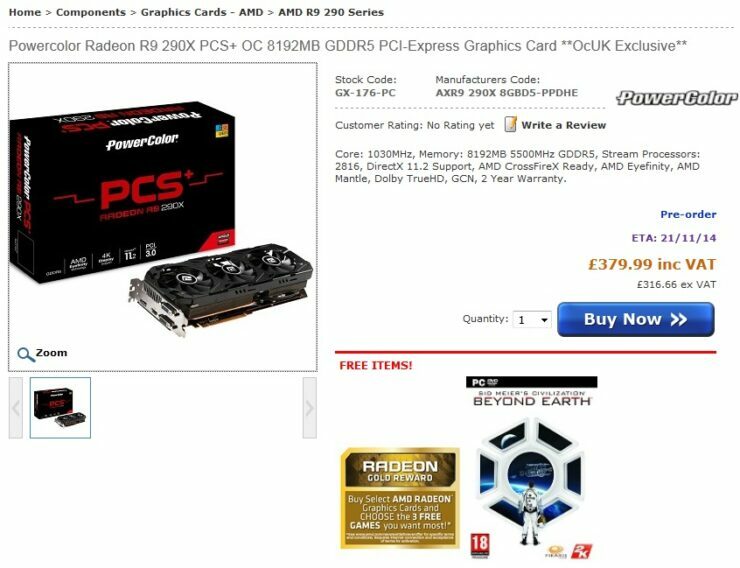 Four R9 290X 8GB cards are already up for pre-order on OCUK.com. Two from Sapphire, a reference model and a Vapor-X model. One from MSI and one from PowerColor. 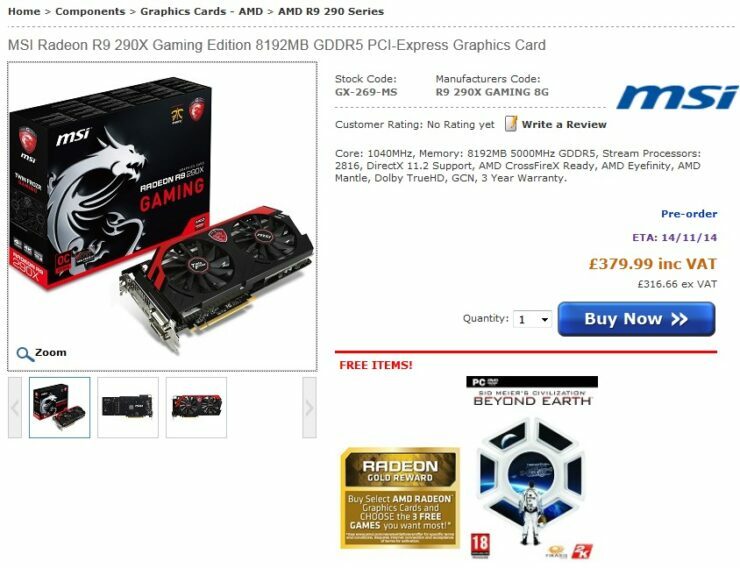 Videocardz has also leaked an R9 290X 8GB card from XFX. Which will make use of the company’s sleek looking Ghost Double Dissipation cooling unit. 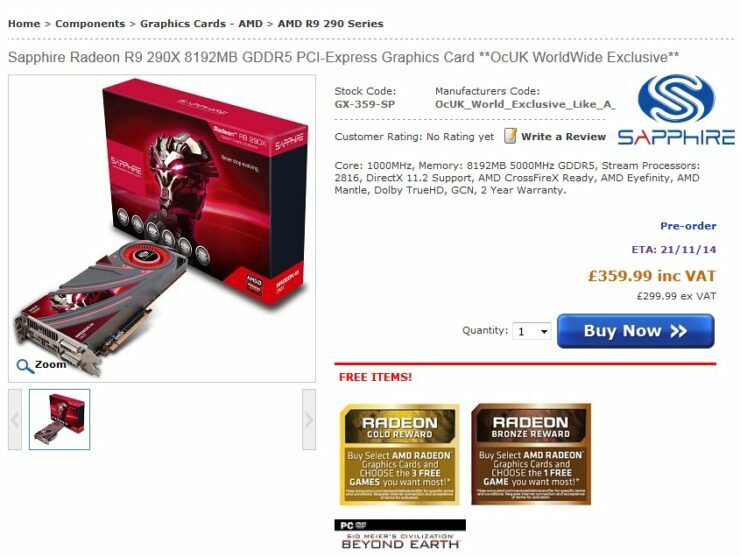 AMD has given all of its partners the liberty to launch 8GB R9 290X cards. So far we’ve seen cards from Sapphire, MSI, PowerColor and XFX. I wouldn’t be surprised to see others such as HIS, Gigabyte and Asus follow suit fairly soon as well. Eight gigabytes of video memory is plenty for 4K, high resolution eyefinity setups such as 7680×4320 and beyond. Naturally you’d want to consider running multiple graphics cards in CrossfireX mode to make full use of the 8GB of memory on such resolutions. While graphics memory requirements have recently seen an explosion thanks to the new generation consoles. Both of which sport 8GB of shared system and graphics memory. 8GB of dedicated graphics memory should prove to be sufficient throughout the lifespan of the new generation of consoles. There has also been rumors of Nvidia working on 8GB GTX 900 series cards which should be coming in November or December. Unfortunately however Videocardz has indicated that Nvidia might be facing shortages of Samsung GDDR5 memory modules. Which could very well end up delaying Nvidia’s 8GB cards to 2015. Nvidia’s GTX 900 series have 256bit memory interfaces. While their AMD R9 290 series counterparts feature memory interfaces which are twice as wide at 512bit. It should prove to be a very interesting point of discussion and examination. To see how exactly this ends up affecting memory utilization and overall performance with 8GB of GDDR5. In any case, there you have it folks. If you’ve been waiting for a high-end graphics card equipped with 8GB of GDDR5 that doesn’t cost an arm and a leg. You should be happy to know that you can finally have such a graphics card.